I’m just trying to understand the indicator/strategy a bit more. What makes the line color change? I understand it represents a trend change but I was curious what specifically makes it change from green to red and vice versa. After digging around, I figured out that the colored indicator was based on a 10-period WEIGHTED moving average. I’m still trying to figure out what is taken into account when the color changes… some kind of angle?? Soooo I will now experiment with that 10 WMA by addin it to my usual analysis and see how it turns out. Can i please get your Ctrade MA slope indicator. Can’t seem to find something similar to the one your have. So I’ve been using this in demo. Like it a lot! Finding the accumulation of Pips is a lot easier with this strategy. However, I’m falling prey to not closing trades on time. I either have to set a trailing stop at a particular point. Have a specific Target of pips and close or close when the MAs change color. Thanks for sharing this strategy @Trendswithbenefits! Ahh alright. We shall wait. Also, do you by any chance know the math behind the color MA slope? i am a programmer by trade and i can most likely code it. I am still demo but have had a great ride on the GBP/ AUD, CAD & USD! Patience seem to be key! Change of direction @ 8.00am (UTC11) EURUSD on the 1 hour TF. Greetings @Trendswithbenefits. I’ve really gotten the hang of this system and really enjoy it. I see massive potential with it. Thanks for sharing. 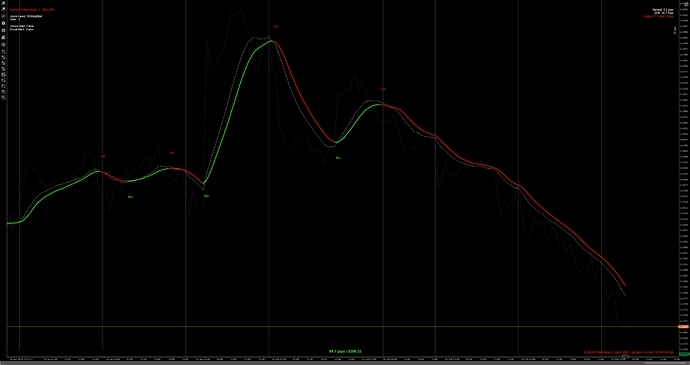 I have been using the indicator you provided for metatrader earlier in the thread. Just downloaded cTrader and I’m in love with the platform, but can’t find the colored MA. Couldn’t find it after a search on cTrader’s website either. Care to help a newbie trader out? Very drawn to your system as I like the clean simplicity of it - thanks for taking the time to share it. I am demoing on oanda’s web platform but unfortunately because I use Linux, I am unable to use Market plug-ins on MT4 or use cTrader desktop unless I switch to Windows . Is there a way to do this without the colour change (some sort of marker for direction change?) or if anyone knows of any other solution. Do i buy if the price goes above the 20 ma but the ma is still red? or do i ONLY buy if the price goes above the 20 ma AND the ma is green? A clean long term (20) display of the EURUSD… Finding profit where some other strategies fail. Change of direction 4th Feb @ 8.00am (UTC11) EURUSD on the 1 hour TF. Started trading demo acct 11/30/18. I am trying to upload my account history and current positions. I’m not to tech Savvy. My closed losses are minimal compared to my profits. But my drawdown on some current postions might be horrifying to some. I am using a version of initial strat. @Trendswithbenefits presents in the begining of the thread. will look for color change on 9MA, lower TF 30M, 1H and look at PA & SR. I am getting better. I have not demo’d the line graph. This is something I had planned to do but haven’t. Though I will have to use it and compare the emotional/maintenance feel. It looks like a winner to me!! Hope to upload graphics tonight. Great thread! It’s been very helpful for me! So you are saying not to learn charting?